Galaxy has been a freelance writer for five years. She is always looking for ways to save money, invest and increase her finances. Love Your Garden or Yard. 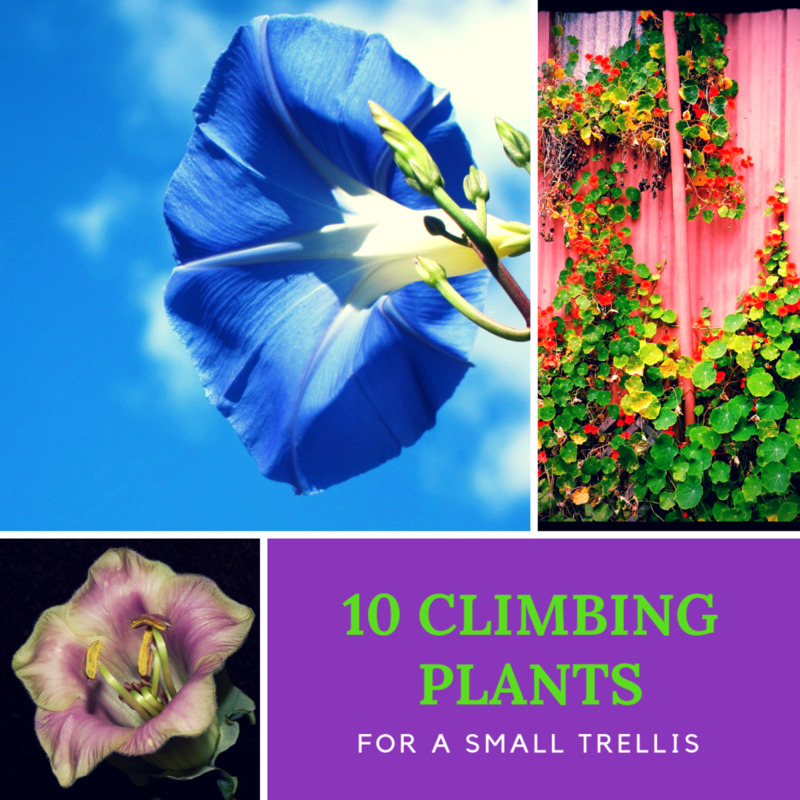 I love gardening but I never seem to have much spare money left to spend on it, so I’ve had to be creative and come up with ways to make my small garden interesting and pretty on a very tight, shoestring budget. My family spend a lot of time outdoors in the garden, eating, playing or simply lounging and I love creating a great place for us all to enjoy.I love it, even more, when I know just how little money I've had to spend to get it that way. I never throw much away, I keep any broken old mugs or interesting jars, glasses and tin pots as I find they make interesting containers for small plants. Herbs look particularly good in small pots - keep them just outside the kitchen, fresh herbs are so much better than the dried variety. 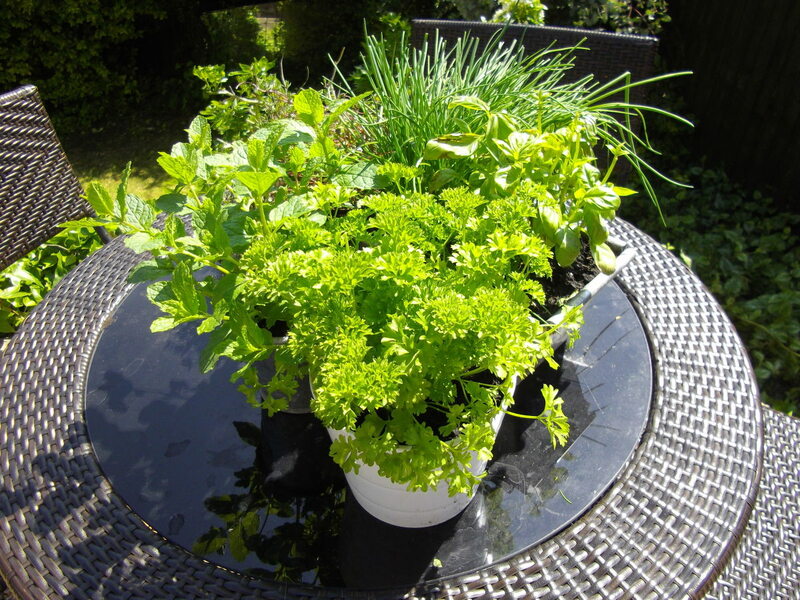 You can buy living herb plants from most supermarkets now, if you pot them up outside they will grow well and last for years. I have had the same mint, chives and parsley plants for at least five years and they are still going strong. They have saved me a small fortune over the years. They look pretty too if you let chives grow they produce beautiful purple flowers. Rosemary too has a very nice flower stem which is a lovely pale violet colour. Pots of Herbs Growing on a Patio Table. How to get Plants for Free. Save seeds, all of the flowers in the pictures above have been grown from seed. You can ask friends or family to save a few seed heads if they have interesting plants. When you have grown them you can always give a couple of seedlings back to the people who gave you the seeds in the first place. Take cuttings from other people's interesting plants - remember to ask for permission first though. Many cuttings can be persuaded to grow roots, even if you just stick them in a glass of water on a sunny window ledge.Remember to change the water every two days to avoid the build-up of bacteria which can stop your cuttings from producing roots. 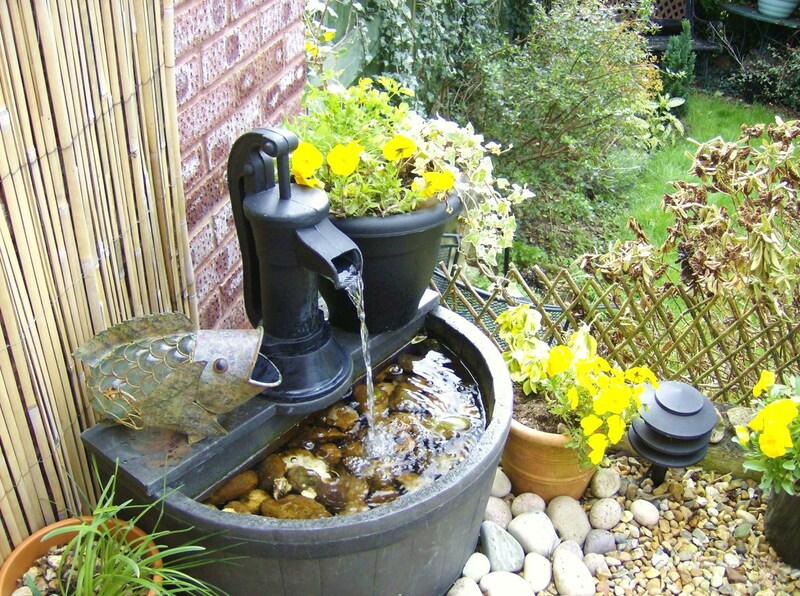 A Water Feature adds Interest to any Garden or Yard. 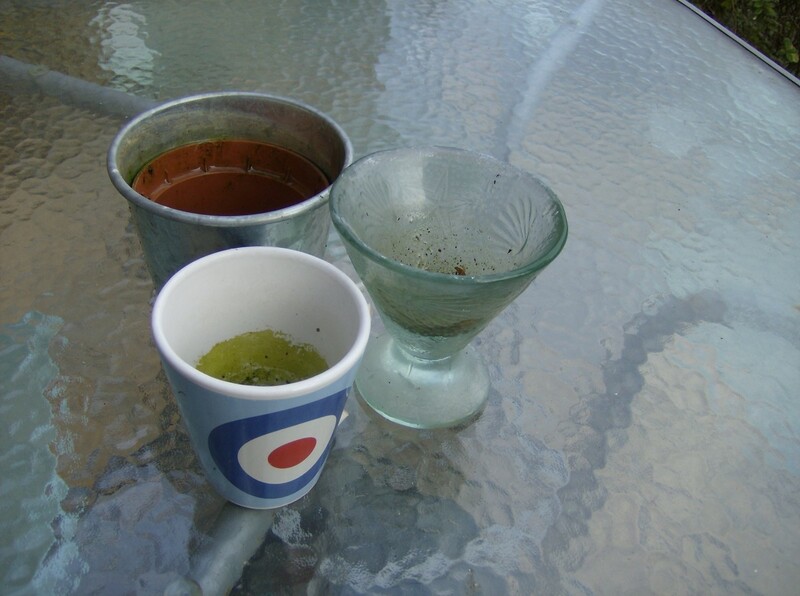 Save Interesting old Cups and Glasses. Help Your Garden Surprise People. 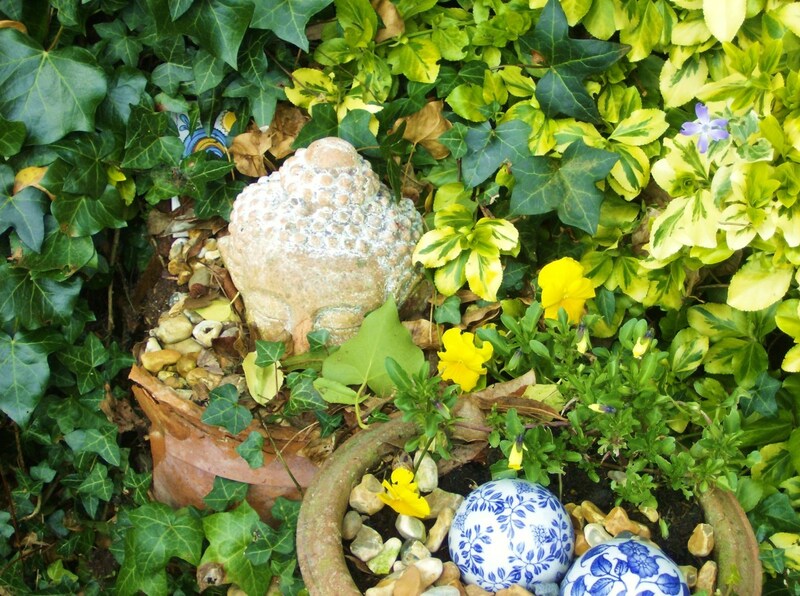 I scour charity shops and car boot sales for interesting looking things that I can place around the garden. I like to surprise people, children love hunting around in my garden as they never know what they might find. The fish by the water feature cost me 50p in a junk shop, he looks wonderful when the sun shines through his glass scales. 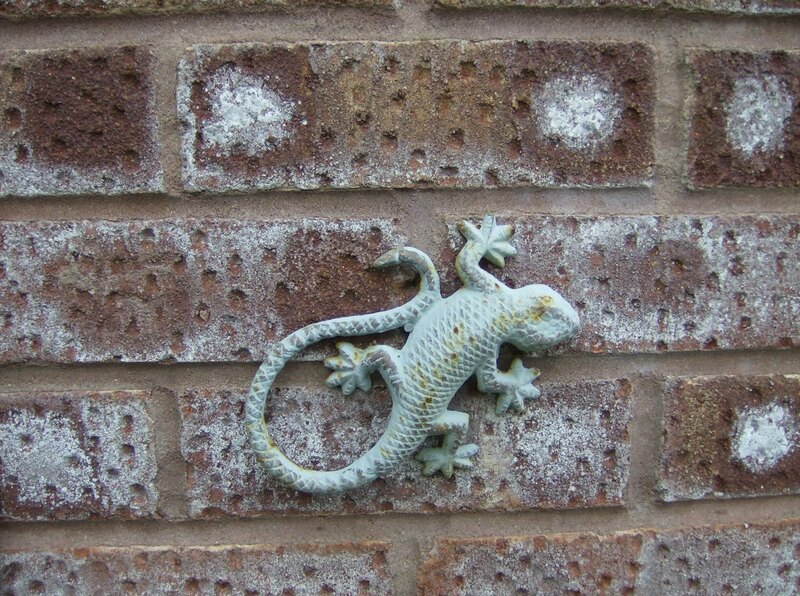 The small copper lizards were four for a pound at a church tabletop sale - a real bargain, I have them dotted around on walls. A Great Bargain Find, Looks Almost Real From a Distance. Wall Hanging Container Filled With Plants. I use old wall hanging candle holders as hangers for wind chimes and hanging baskets. 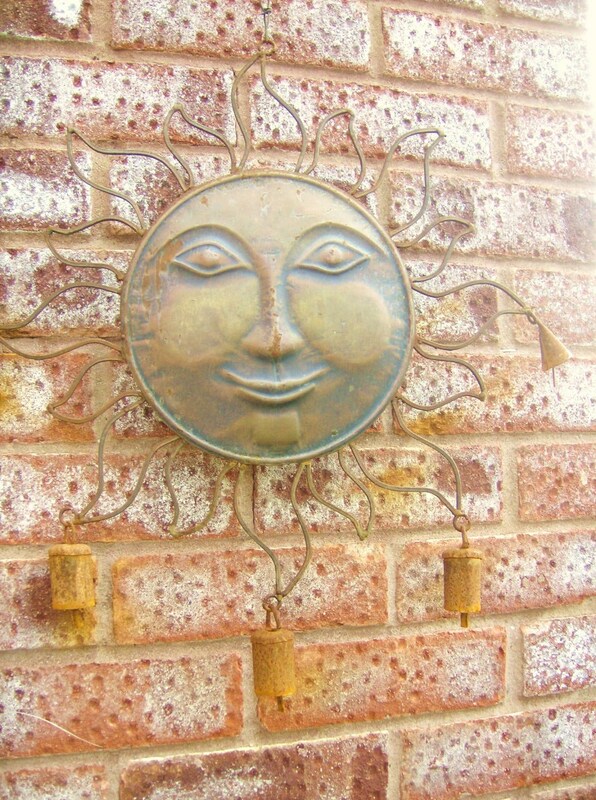 The sun face wind chime with the bells was given to me by the shopkeeper because it was the last one he had and it had gone rusty! 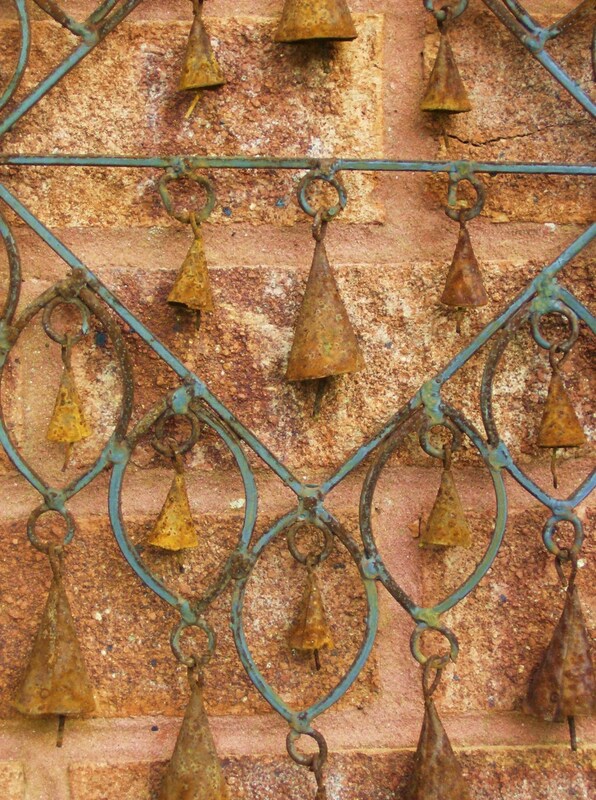 I happen to think it looks beautiful that way and would have rusted soon enough anyway, as you can tell from the hanging bells that I did buy from him the same day. 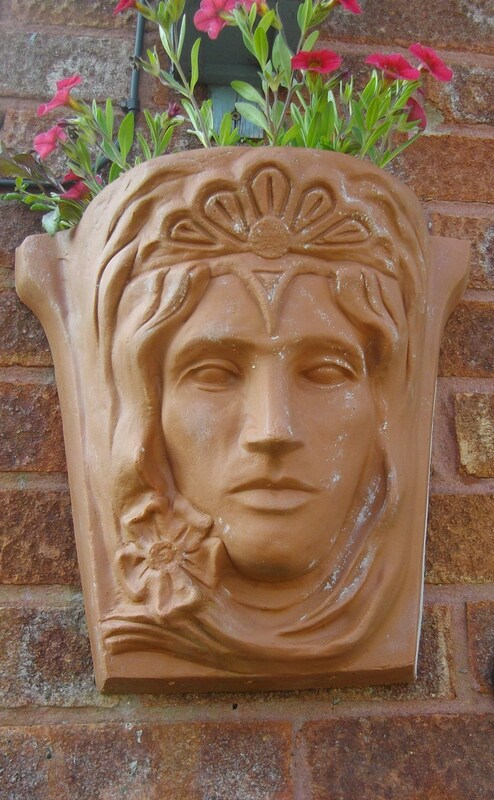 Interesting wall mounted pots look good simply filled with any trailing plant, I think my queen's head pot looks best with reds and pinks. You could also try filling something similar with trailing strawberries or cherry tomatoes. Rusty Lamp, Shells and an old Bucket can add Interest to a Dark Corner. When I take a trip to the beach I always pick up a few seashells as they make an interesting and practical mulch for pots, they keep moisture in and the weeds out. Beaches are a great place to pick up interesting looking driftwood too. Never take large rocks or cobbles from beaches it adds to coastal erosion. The cobbles dotted around can be bought from most builders yards for a couple of pounds a bag. Much cheaper than if you go to a garden centre. Lighting is an important tool to make a garden more interesting. 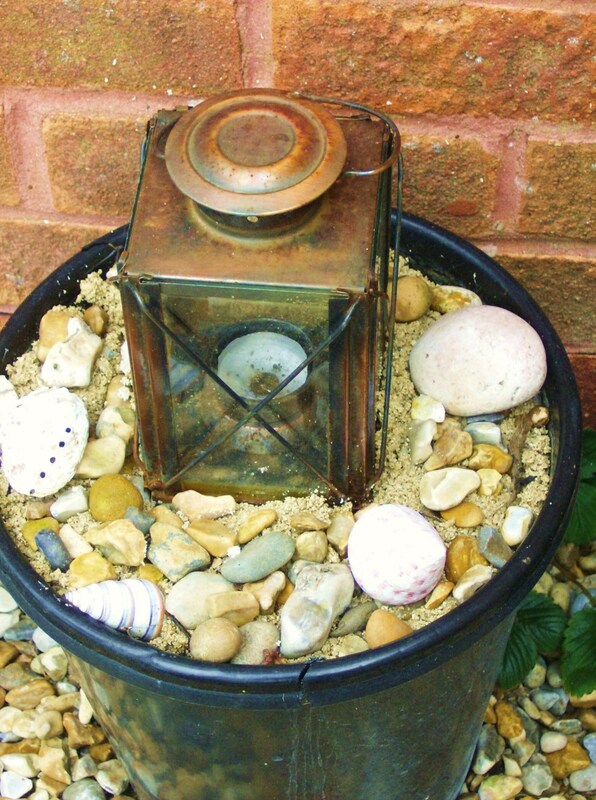 I use old lanterns and stand them in pots of varying heights filled with soil and sand then top them with shells and pebble. I make my own compost by saving all the raw vegetable scraps, tea bags, coffee grounds and cuttings from the garden, I have two compost bins on the go at all times so I have a ready supply of nicely rotted compost whenever I need it. I also collect the fallen leaves in autumn and make a leaf pile in a secluded spot at the bottom of the garden. 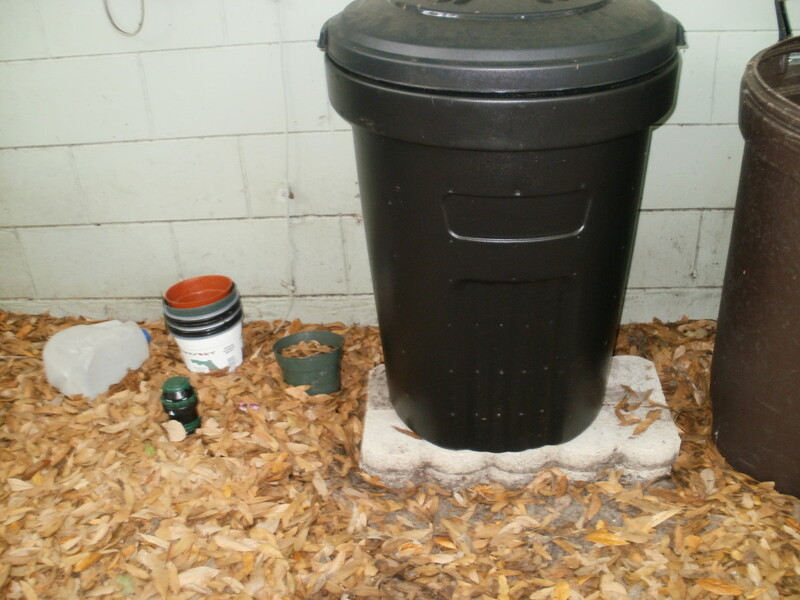 This too makes an excellent compost. If you group together fun, different things it makes for a much more interesting garden than a very formal one in my opinion. And if you follow these small tips it shouldn’t cost you very much either. Old Mocking Mask Found in a Charity Shop. 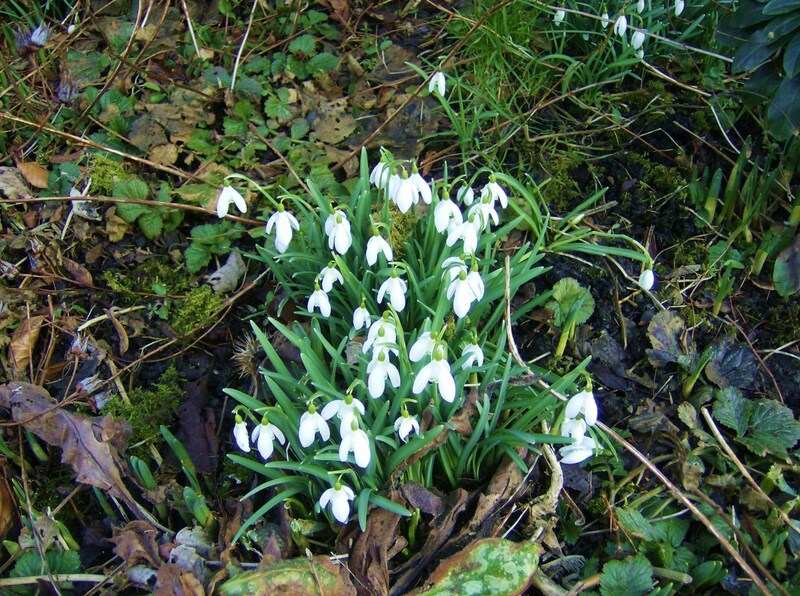 Plant bulbs that divide themselves each year, snowdrops are perfect. 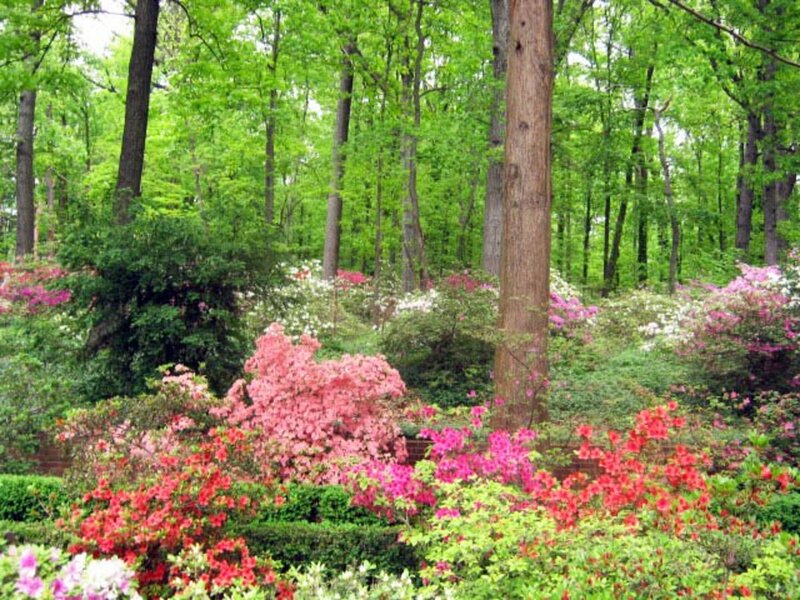 Chose a shady area of the garden, under a tree or large bush. Plant the bulbs at least twice their own depth and watch them multiply year after year. After flowering, you can dig up a few bulbs and spread them around the garden for even more flowers next season, or swop them for something else with a friend or neighbour. Simple Tips but They do Work. 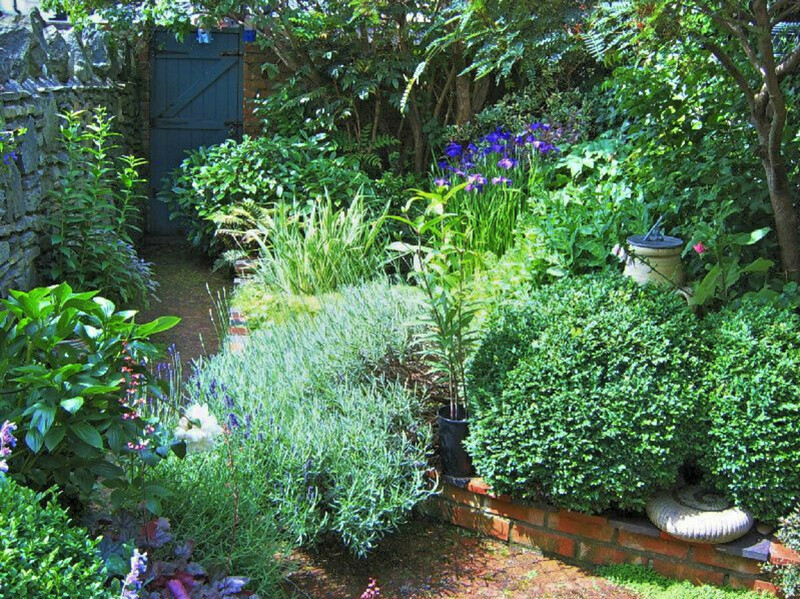 By using these simple tips you should be able to make an interesting small garden or yard on a tight budget too. You can easily adapt these tips for a roof garden or balcony, just use pots and hanging baskets and be careful of weight limits. I was Galaxy59 on Bubblews too. I know I followed you as Hollyhocks100 there, I did join persona papers but never really got into the site. I am looking forward to writing here a lot more in future, I know people who have made a success from this site and I hope we can both follow their lead! I knew as soon as I saw your profile picture that we have been connected elsewhere and it must have been Bubblews or persona paper, if I´m right, what was your pen name there? I´m dying to make the connection. I was Hollyhocks100. After a very long break from here I just posted my first hub today, and you are so right, Hubpages is still a really good place to write and earn, and I´m motivated more now to come back. Thanks bac2basics. I must look out for crystals next time I am in a charity shop. Great tip. I really love finding things I can re-purpose for my home and garden. Much more fun than buying something new and ready made. I think you are right about us being connected, I 'm sure I know you too. I am trying to get back into things here, it's still a great site. Lovely hub and great ideas. My daughter picks up many treasures from car boot sales and charity shops and I´m often envious of her finds. One thing she looks out for is cheap costume jewelry especially things with crystals, and has made some lovely sun catchers from things that cost just a few pence or less than a pound. Thanks realmca for the comment and the link. Inspiring! 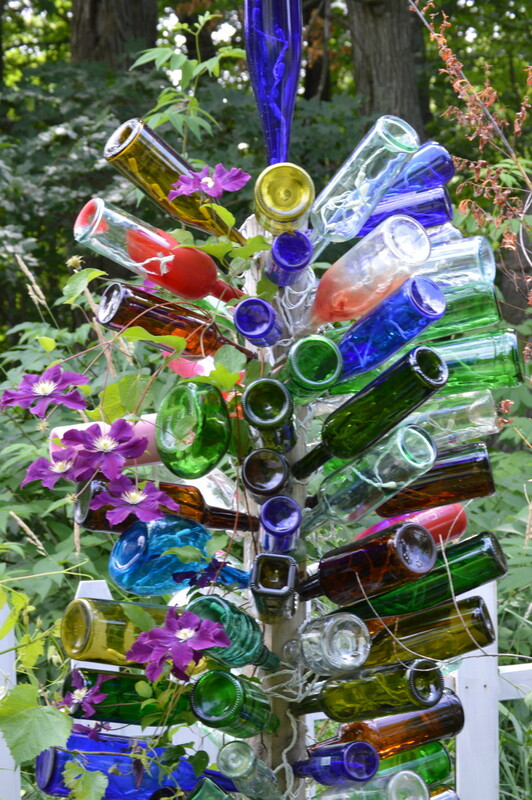 I love how you make your garden interesting with the unusual cups and glasses and that it's a children-friendly garden. I liked your article so much that I linked to it from an article I wrote on kid-friendly gardening. 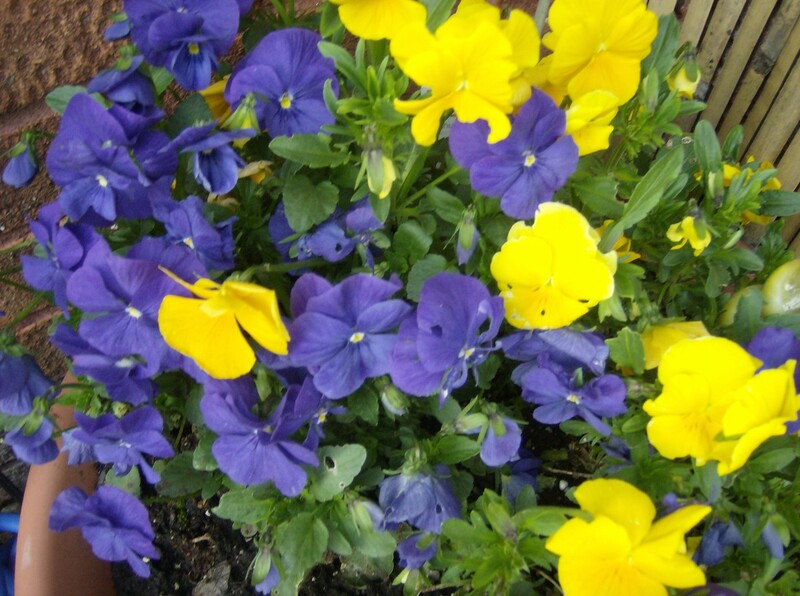 Thank you, MarleneB, I hope you find some great things for your garden and have fun doing it. I love what you've done with your garden. Your tips are most helpful. I don't know why, but I never thought about going into a thrift shop to find little things to put into the garden. That tip alone is going to help me give my garden a boost. Thank you so much for sharing your ideas. Thank you NotTooTall, I love the hunt too, you never know just what you are going to find. Nice Hub. Really like your fountain. 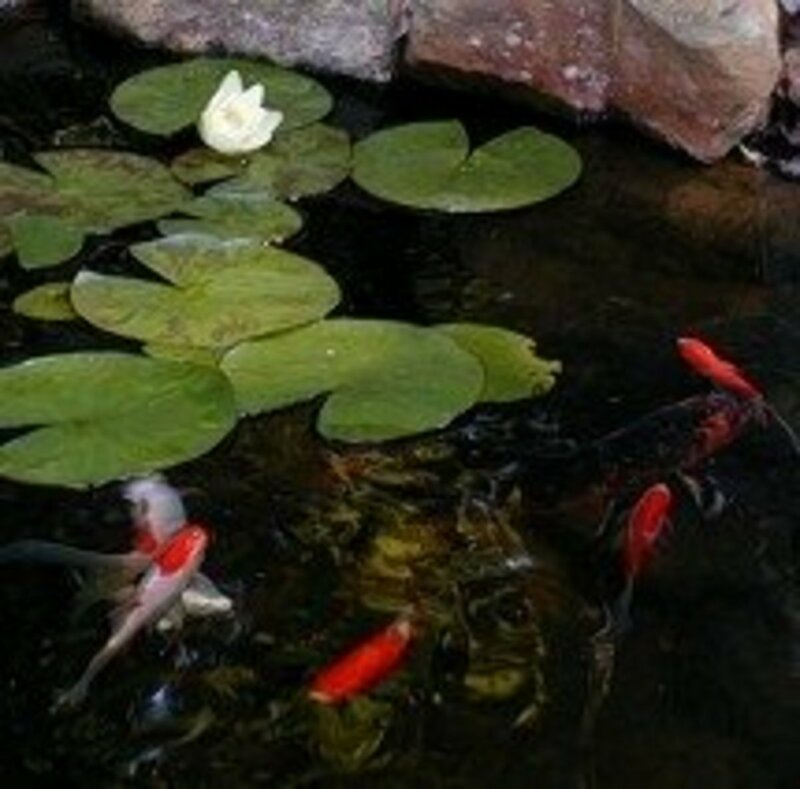 I like to shop yard sales, so finding new garden treasures on a budget is easier this way. Love the hunt! Thank you wewillmake, gardening is a wonderful hobby. Thank you Sen.sush23, that water feature is made using half of a wooden beer barrel. I am so glad that you found this hub useful and thank you for the vote up. Good luck with your garden. 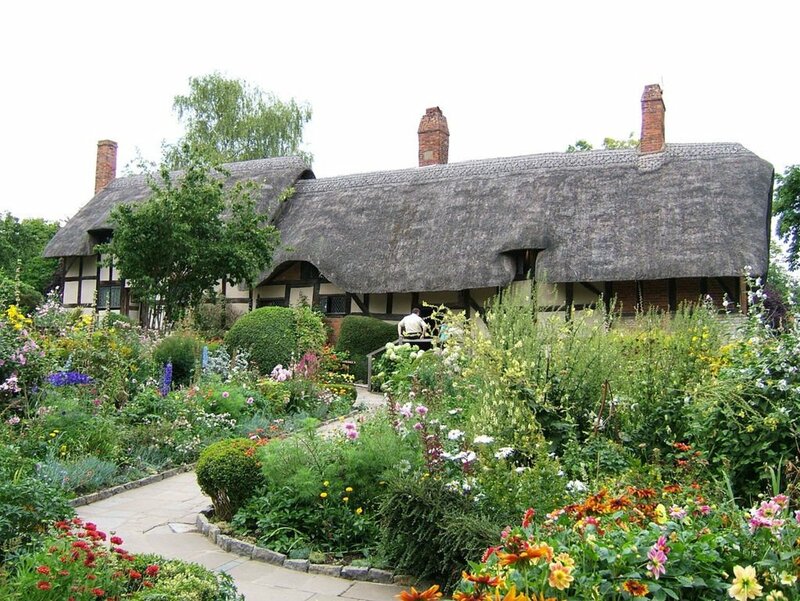 i am planning on a terrace garden, and your ideas will be a bonus. I have been looking for a fountain of sorts for the garden,but the one you have here is unparalleled. I wish I would come across something like this. Great hub, voted up as beautiful. Thanks for SHARING. Thank you, it's always wonderful to be inspiring. I love gardening too and you have inspired me to find some more treasures. theherbivorehippi- thanks so much, I love my windchimes too I think they look so much better all rusty then when they are new. itakins - thanks for the comment. 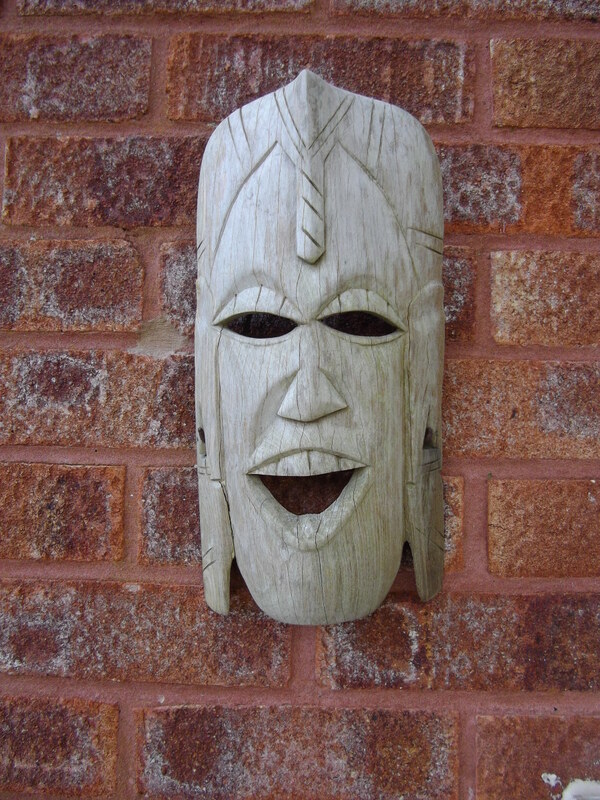 I love searching around for odd things for my garden, it's great fun. I am in lOVE with your windchimes! These are all fabulous photos! Beautiful hub! I love these ideas.I think a lot of the fun and creativity of gardening is finding bits and pieces to recycle.Great hub. Very true, they just taste so good and they're free! Good tips here! Fresh cut herbs from your own garden can't be bought at any price!